We came to see the social-democratic state that is secretly envied by Indians. Covering the southwestern tip of the country, Kerala is considered the most-advanced, people-centered and least-corrupt state in India. A description published in Forbes magazine. It is a capitalist system, built on a foundation that includes communism and christianity. Picking tea leaves is known as woman’s work in Kerala. But it’s good paying work with provided housing and healthcare. The women use hedge clippers attached to a basket. My last trip to India in 1998 began in Delhi, home-base for the more anarchic north. A place where people compete with cows for living space on street corners and curbs. Everything, planning the route, securing transportation and accommodation in the controlled chaos, was more difficult than I anticipated. It was exhausting. Compared to India, American capitalism is for sissies. In India everyone’s job is to separate you, the wealthy Western tourist, from your cash. I laughed when I heard the General Manager of the five-star Taj Mumbai, in the documentary Hotel, say that in India “guest is God. Frankly, we never say no to anything.” That’s the truth. For these billion people, you the guest are God. And while you are their priority, their survival means more. Promises will be made, ask for it and someone will promise it, but guarantees should not be expected. The traveler must be on her toes at all times, separating fact from fiction and deciding who can be trusted. It is mentally, sometimes physically, draining work. In the end you will have paid, but you might not have the service or product that you expected. 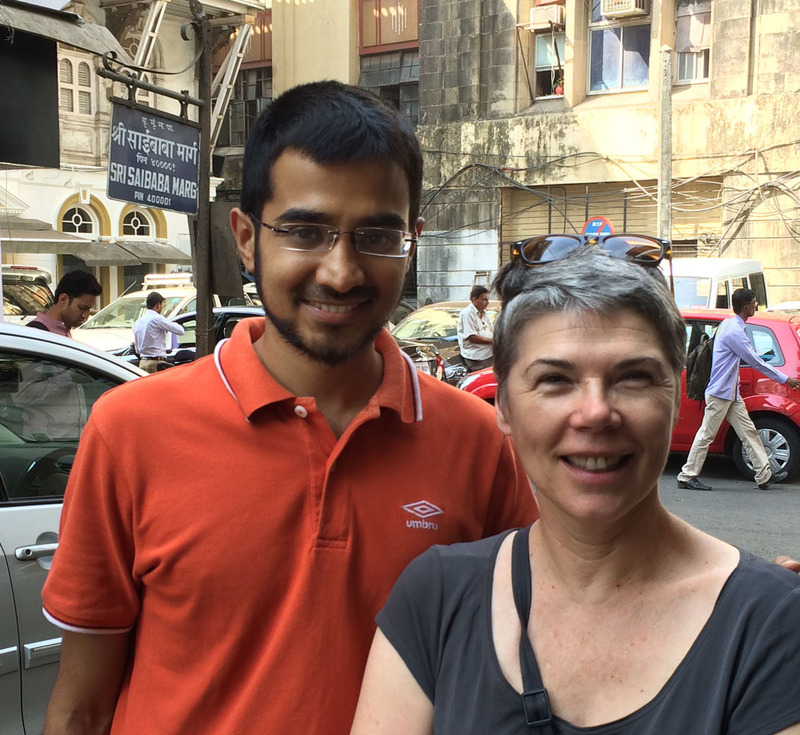 We met Abbas Slatewalla of India Someday in Mumbai for lunch on our arrival. His company planned our visit, suggesting and booking hotels and securing and vetting our drivers. Travelers call Kerala India 101, but I wasn’t convinced. This time, scouring the comments in the New York Times travel section, I found India Someday. Highly-recommended, the Mumbai-based travel agency is a cross between a guide book and a tour company. We gave Abbas Slatewalla, who studied in Utah, our budget and our ideas. India Someday planned the route, suggested hotels, made the bookings and vetted and secured our drivers. All by email. Abbas’s staff was available by phone and email. We had one confusion over a taxi fare and Abbas was reached by phone and the issue was quickly solved. His service was exemplary. A trading state since 3,000 BC, Kerala’s economic ascendance began with the spice trade. Just one acre of cardamon, the world’s third most expensive spice after vanilla and saffron, can support a family, even a village. Kerala has had enormous outside influence. The Dutch arrived in the 1600s, followed by Portugese and British. Today the economy includes agriculture, technology and tourism. Since the mid-1950s, voters have demanded benefits for workers, including education, public healthcare, trade unions and a women’s movement, creating educated, socially-conscious locals. Meet the Joseph family. 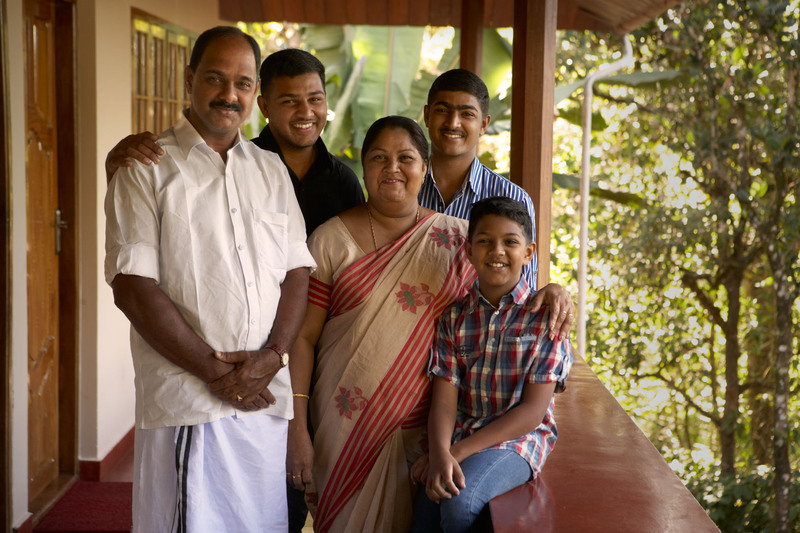 Tomy, a botanist, his wife Rajee and their three sons operate the Rose Gardens homestay in Munnar. One of the highlights of our stay was the guided tour of the family’s working garden and property. Our first stop was Munnar, the home of tea, and the homestay owned by the charming Joseph family, Tomy, his wife Rajee and their three sons. The oldest is studying for an MBA, the middle son will be an accountant and the youngest, he doesn’t know yet. In addition to its five guest rooms, the Rose Garden is a working garden with cash crops. Tomy Joseph is a botanist. Concerned about the availability of water for his crops, he dug a seven million liter holding tank on his property to collect rainy season runoff. India, like many democratic countries, including the U.S. and Canada, has seen a trend over the past twenty years toward electing conservative governments. The influence of the left has waned in India as well, say political observers. Since the mid-1950s, leftist and left-influenced governments have created in Kerala, a state that boasts a 94% literacy rate, against 65% nationally and an 87% literacy rate for women, three times the 33% national rate. The state of 60% Hindus, 20% Muslims and 20% Christians has largely sidestepped the clashes of other parts of India, mired in crushing poverty, proving the best cure for extremism is an educated, thriving middle-class. But there are complaints.The most pressing is a high unemployment rate, as high as 25%, coupled with a highly-educated, young population. The young complain that parents still have too much influence on their futures. “When you are born, your father looks at you and says ‘you I will make an engineer,’” Allwyn, the owner of Marari Dreamz, a beach community homestay told me. He left science for the tourism industry. His wife Jency created the best food that we ate in India. The most creative combinations of local ingredients that we have eaten anywhere in the world. Imagine crab with cinnamon. Keralytes talk of corruption and nepotism and say change does not come quickly enough, and that more can be done. It’s the 21st century global lament, those in power are serving the interests of the few, the wealthy and largest corporations. Those on the lower rungs of the economic ladder, who pay the lions’ share of taxes feel forgotten. 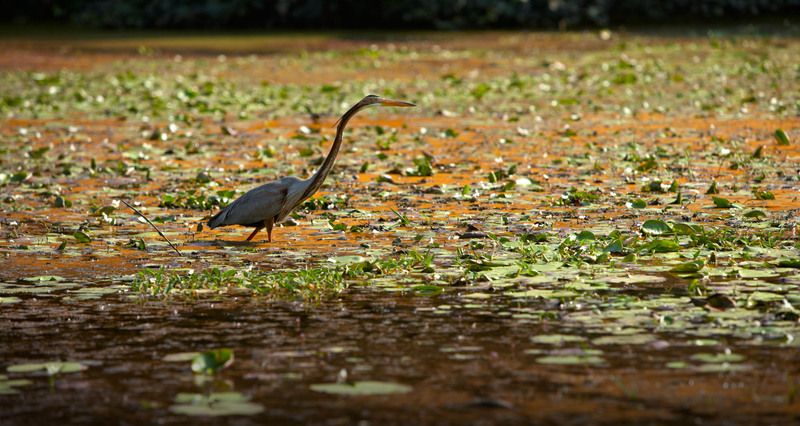 Nearly 500 species of resident and migratory birds are found in Kerala’s backwaters. Our last view of Kerala and its people came in the famed Backwaters. We booked two surprisingly touristy, and expensive, but enjoyable water tours. The first was a covered long boat. We spent three hours traveling the small canals seeing villages living as they have for centuries on the waters edge, washing, cooking next to the canals. Many of the houses now made of concrete block with aluminum roofing. We searched for the iridescent and brilliant blue Eurasian Kingfishers. The boat was arranged by our homestay, the Backwater Heritage Homestay, where the owner, father to an American-based nurse-daughter, told us one of his regular guests is Arundhati Roy, author of the God of Small Things. The Kerala houseboats, known as kettuvallams are a prominent tourist attraction in the backwaters. There are 2,000 of these houseboats creating an odd, but surprisingly enjoyable tourist attraction. Basically the boats travel in a conga-line formation through the backwaters. Tourists passing tourists waving to each other on the boats. The other water excursion, an overnight houseboat tour on the giant lakes off the Arabian Sea with Eco Trails Kerala. 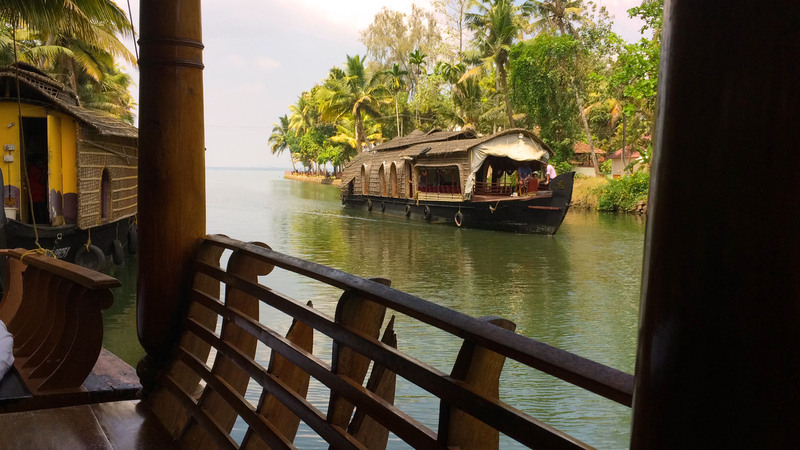 We joined a conga-line of handcrafted kettuvallams, anjali wood hulled crafts with air conditioned bedrooms, capped with a vaulted roofs woven out of palm leaves through the Backwaters. Our boat carried a crew of three, driver, cook and generalist, who’s job was to speak English and chat about his life, the area and Kerala. Our final stop was the Old Harbour Hotel in Fort Cochin, a restored 300-year old building. We walked along the seawall, joining middle-class Indian families shopping in the marketplace and watched the Chinese fishing nets. The system, fixed on land, requires a crew of six, and uses a cantilever to drop the nets into the water. It is a beautiful process, like watching a dance, to see the nets lowered to the water and rise again. The Old Harbour Hotel in Fort Kochi in Kerala is a restored 300-year-old building. Built in the Dutch architecture style with Portugese influence, it was the first hotel of old Cochin. Our one-month visit was $2,500 each. It included in-country airfare, 14-days in cars with drivers, taxis and a short train ride on the historical single-gauge railway through the Nilgiri Mountains to Ooty. We stayed in a range of accommodation from family homestays to upmarket hotels. In one in Thanjavur, like old colonialists, we sat on the veranda for dinner, uncomfortably watching Indian men shovel river sand into oxen-powered carts to be sold at construction sites. Our monthly cost included meals, generous tips to everyone that moved, plus donations at temples and $50 US to our second driver who was rear-ended by a motorcycle. Knowing how carriers treat drivers, even in the U.S., regardless of fault, we didn’t want him to lose a chunk of his weekly wages, about 200 Rupees ($8) per day, for a repair that was not his fault. Our final tally also included shopping and our fees to India Someday. We bought Indian bangles and pashmina and silk shawls, hand-crafted bronze figurines and hand-painted-with-flower-petals artwork. A traditional long boat in the canals near Alleppey, Kerala. We could have easily halved the cost by booking ourselves online, using more two- and three-star hotels and homestays and traveling by train and bus. But that’s work. Kerala is India 101. The beginners introduction to an intriguing and disturbing country of inspiring people. It forces an introspection like no other place I’ve been. And it confirms that we are all the same, with the same desires of home and happiness. The Indian version of a dump truck. Men collect sand in the river near Tanjore in Tamil Nadu and sell it at construction sites in the city. 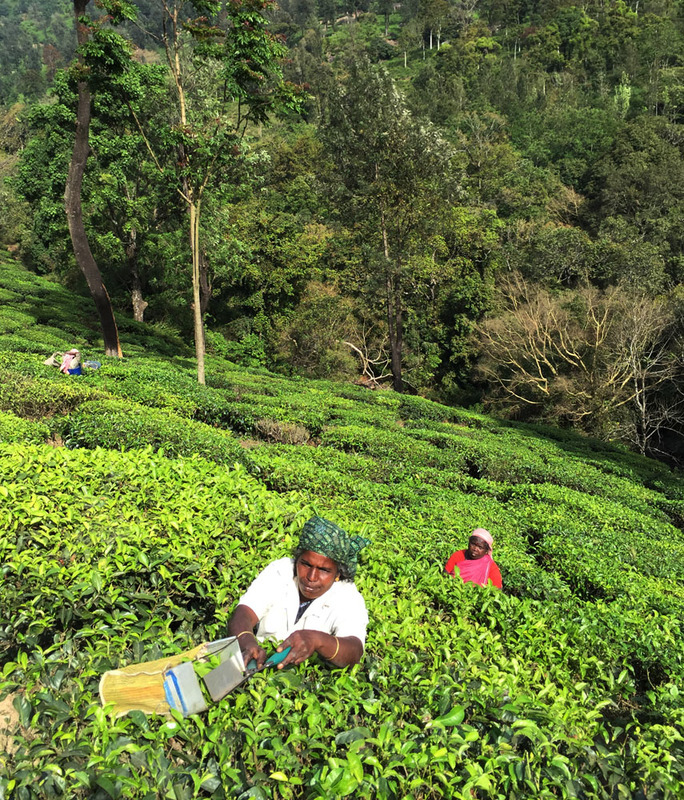 There are more than 50 tea estates in and around Munnar. Tea bushes are planted one to 1.5 meters apart to follow the natural contours of the landscape. A Tata (really) mini van parked on the street in Kumali. Marari Beach on the Arabian Sea, 11 km from Alleppey in Kerala, is lined with fishing boats. Fishermen head out to sea every night. The best meals we ate in Kerala were at the Marari Dreamz, a homestay, owned by Allywn and Jency, on the Arabian Sea. Jency produced incredible meals. My favorite was her crab with hint of cinnamon. But this breakfast was pictured was also delicious. Life in the Keralan backwaters revolves around the water. Almost every household has a small canoe or long boat that is used in the family’s daily activities. Big sister is doubling her brother from school along a canal in the Keralan backwaters. Wildlife in the brackish lagoons of the famed Kerala backwaters. The backwaters include five large lakes linked by canals and fed by 38 rivers. Very interesting post. Loved the photos. Crab with cinnamon, huh? From the first bite, Salena, I knew there was something different in the crab, but I had to power my way through two to come to the conclusion that the mystery ingredient was cinnamon. Confirmed by Jency. Delicious. Spicy, sweet, savory — combined in this tantalizing combination. That’s the amazing thing about Indian food, the unusual, counter-intuitive combinations. And speaking of Indian cuisine, I highly recommend The Oven, the Indian Himalayan restaurant where we ate last night in Lincoln, Nebraska. Fabulous. Gosht Akbari is lamb dressed with dates, prunes, apricots and jalapeños. Spicy, sweet, savory. Really, really enjoyed this instalment. MacGyver is such a gifted photographer, and I don’t get to see much of his work these days. I’ve returned several times to enjoy this, as once wasn’t enough. Between his images and your descriptions, this was a treat. Thanks! Thank you for your note Jennie. India is one of those places where travelers say they need time to process the experience. I agree. The several months that elapsed between experiencing and writing was interesting for me to see if my initial thoughts had changed and what jumped out. And this was it.